Too often, risk management plans address technologies and markets, and fail to address internal issues such as reorganizations, workplace politics, toxic conflict and reductions in force. In this program we explore a framework for addressing the issues that arise as a result of human behavior — and misbehavior. Effective risk management is a critical success factor for most projects. Although most of us can do a pretty good job assessing technological risks, risks related to human behavior — and misbehavior — tend to resist many of our best efforts. 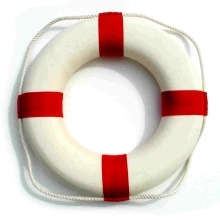 A life preserver. We don't usually think of marine life preservers as risk management devices, but that's exactly what they are. Perhaps we need to begin to think about some of our risk management practices in terms of preserving lives, because — too often — preserving lives is exactly what they do. This program provides executives, managers, project sponsors, project managers, and risk managers a framework for assessing and monitoring risks that relate to human behavior — including the behavior of individuals, teams, organizations and people in the larger context outside the organization. Most risk managers are accustomed to dealing with factors associated with old and new technologies, markets, and "acts of God." Human-centered risk is different from these risks, because objective assessment and evaluation requires acknowledging personal and organizational limitations and past failures. Since some of those limitations and failures might apply to the risk managers themselves, or to their superiors, there's a tendency to deny their existence, to underestimate their effects, or to invent alternative explanations for past performance disappointments. In this program, we explore an approach to risk management that relies on two sets of tools. The first is a framework of categories related to capability, organization, external context, risk management, and workplace politics. The second is a set of principles for guiding the assessment and management of human-centered risk. Using a framework encourages risk managers and their superiors to accept a more objective assessment of the realities of human-centered risk. Finally, because no methodology is universal, we show how to extend these tools to suit the needs of any specific situation. We learn through exposition, application to simulations and cases, and post-program activities. This program is available as a keynote, workshop, seminar, breakout, or clinic. Become more skilled at choosing from among political options. The ambiguity of "Human-Centered Risk Management"
The learning model of this program is both conventional and flexible. It is conventional in that it can be presented in a seminar format that emphasizes tools and techniques, using fictitious cases designed to illustrate their use. But at your option, we can also include a "clinic" approach in which we address specific examples drawn from your own experience or from your own immediate needs. Executives, leaders, managers, project sponsors, risk managers and project managers. We work either with individuals, or with an entire team or with a group drawn from many teams. At this time, there are no public events scheduled for this program. But if you would like to observe the program, I might be able to arrange an opportunity with a current client. rbrenZRWyOgrCqlhHbqbTner@ChacfVUYLMOMRTdzuuIOoCanyon.comContact Rick for details.